There are very few infographics templates that can match the creativity of the Puzzle Infographic Template. With state of the art designs and slides, this is a powerpoint template that delivers quality and a tasteful different way to create a presentation. The layouts are very captivating, and each diagram has been worked on tirelessly to make sure everything is going to fulfill any user’s presentation desires. All of the slides are fully customizable and easy to do so as well. Meaning time and effort are better spent on the information and specifics part rather than trying to create an entire template from scratch. 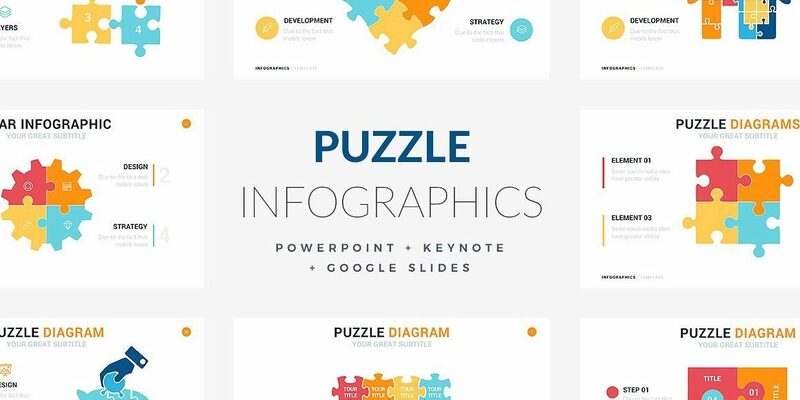 The Puzzle Infographic Template is one of the too few infographic templates that are compatible with Google Slides, Apple Keynote, and Powerpoint, so the user has a variety of sites to work with depending on what’s more convenient for the presentation. It is an infographic template designed to keep audiences entertained and focused on the visuals and organization because everyone values information presented in an appealing and easy to follow manner. The template helps everyone save time and an unnecessary amount of effort so that it can all be streamlined to perfection. Downloading the Puzzle Infographic Template is the most efficient tool for a user trying to create a graceful and modern piece of work that any audience can easily learn from.